Founded in 1879, St. Louis Children's Hospital is one of the premier children's hospitals in the United States. It serves not just the children of St. Louis, but children across the world. The hospital provides a full range of pediatric services to the St. Louis metropolitan area and a primary service region covering six states. As the pediatric teaching hospital for Washington University School of Medicine, the hospital offers nationally recognized programs for physician training and research. St. Louis Children’s Hospital (SLCH) serves the health care needs of children, from infancy to adolescence, and advocates on behalf of children and families. Founded in 1879, SLCH is the oldest pediatric hospital west of the Mississippi River and the 7th oldest in the United States. SLCH has 390 licensed beds, which includes a 41-bed pediatric intensive care unit, 38-bed heart center, a 125-bed newborn intensive care unit, and a 16-bed pediatric bone marrow transplant unit. Each year the hospital receives about 275,000 patient visits, and the school of medicine receives about 150,000 patient visits. SLCH offers comprehensive services in every pediatric medical and surgical specialty. SLCH has served patients from all 50 states and more than 80 countries. 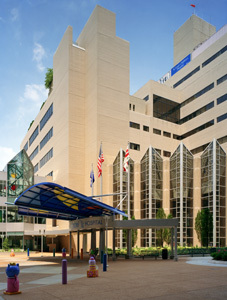 St. Louis Children’s Hospital is one of 78 members of a non-competitive national collaborative of children’s hospitals, the Children’s Hospitals’ Solutions for Patient Safety Network. The hospitals are working to transform pediatric patient safety in pursuit of an urgent mission: to eliminate all serious harm across all children’s hospitals in the United States. More information can be found here. 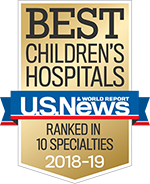 St. Louis Children's Hospital is recognized in the top 7% nationally by U.S.News & World Report, which in 2017 ranked the hospital in all 10 specialties surveyed. In 2015 St. Louis Children's Hospital was re-designated as a Magnet® hospital by the American Nurses Credentialing Center's (ANCC) Magnet Recognition Program, which recognizes excellence in nursing. Only 3 percent of hospitals nationally have achieved Magnet re-designation. Physicians at SLCH are faculty at Washington University School of Medicine (WUSM), ranked as one of the top medical schools in the nation by U.S.News & World Report. The Department of Pediatrics is recognized by the NIH as a Child Health Research Center of Excellence in Developmental Biology. WUSM/SLCH is one of only a handful of centers nationwide with this status. The Children’s Discovery Institute, a joint venture between St. Louis Children’s Hospital and Washington University School of Medicine, focuses research, diagnostic and treatment resources on four pediatric diseases with genetic origins – congenital heart, lung and respiratory, cancer and musculoskeletal and metabolic diseases. Using a team-based research model, the Institute enables SLCH to leverage the intellectual and physical resources of Washington University, including access to human genomics, to advance the health of children. SLCH has received Professional Research Consultants’ (PRC) 5-Star Award for 10 consecutive years. This designation is given annually to each health care facility that scores in the 90th percentile or above for the “Overall Quality of Care” percent excellent score in PRC’s national client database for the prior calendar year. SLCH is the only pediatric hospital in Missouri and Illinois that is nationally recognized by the American College of Surgeons (ACS) as a Level 1 Pediatric Trauma Center (highest classification of trauma care). Also, it is the only pediatric trauma center in the region that will re-attach and re-vascularize severed limbs. Children’s Hospital has active transplant programs for heart, liver, kidney, lung and bone marrow. It is one of the top pediatric transplant centers in the country. SLCH was the first hospital in Missouri to develop a comprehensive pediatric Bone Marrow Transplant Program. SLCH also performed the first bone marrow transplant, and the unit is one of the only pediatric facilities nationwide certified to perform transplants from unrelated donors. Since 1985, surgeons have performed nearly 250 liver transplants with excellent long-term survival and quality of life for most patients. The area's first split liver transplant was performed at SLCH by dividing a single donor liver between two recipients. SLCH's liver transplant program is one of the largest in pediatric volume in the Midwest and in the nation. Since its inception in 1978, the Cleft Palate and Craniofacial Institute has treated over 11,000 children with cleft lip and palate and other conditions affecting the head and face. The Institute offers evaluation, diagnosis and treatment for congenital and acquired head and neck deformities. Our epilepsy center is recognized by the National Association of Epilepsy Centers (NAEC) as a Level 4 epilepsy center. Level 4 epilepsy centers have the professional expertise and facilities to provide the highest-level medical and surgical evaluation and treatment for patients with complex epilepsy. We actively serve more than 900 children with cochlear implants, about 300 of whom are using bilateral cochlear implants. The program is heavily involved in clinical research and trials, which provides patients with the latest technology and treatment options. SLCH is the one of the largest treatment centers in the nation for the non-surgical cast correction of clubfoot. For patients with cerebral palsy, SLCH offers both medical and surgical treatments through its internationally recognized Cerebral Palsy Center and Center for Cerebral Palsy Spasticity. Dr. T.S. Park, neurosurgeon-in-chief, has performed more than 3,800 dorsal rhizotomy procedures and directs the most active surgery program to reduce spasticity in the world. Through its cardiac catheterization lab, SLCH provides surgical alternatives to repair heart defects; more than 700 cardiac catheterization procedures are performed each year. SLCH was one of five sites in the United States to test implantation of a device to correct heart abnormalities. SLCH was the first hospital in the state of Missouri to implant the Berlin heart, a ventricular assist device that serves as a bridge to transplant by supporting cardiac function. SLCH was chosen as one of 12 pediatric transplant centers in the United States to participate in an IDE study with Berlin heart which led to FDA approval of the device in December 2011. SLCH performed the first of three successful ABO-incompatible heart transplants in 2004 by transplanting organs to infants with an unmatched donor blood type. This type of heart transplant remains an option at our center for certain infants awaiting heart transplant. SLCH is the first pediatric facility in Missouri and one of a handful of centers across the country to develop an advanced surgical suite exclusively for minimally invasive surgical procedures. In the largest and longest childhood asthma research study ever, researchers at WUSM and SLCH helped determine that inhaled steroids are safe and effective for children with mild to moderate asthma. In addition to research efforts, the hospital offers a multifaceted approach to asthma care that stresses prevention, education and collaboration with community pediatricians. SLCH is accredited by the American Diabetes Association. The hospital is the only pediatric hospital in St. Louis and one of only two in Missouri accredited by the ADA. SLCH extends its services to children and families in the community through numerous health workshops and outreach interventions. Recent advocacy efforts have included programs on nutrition and fitness, childhood immunizations, home safety for special needs children, car seat and helmet safety, and injury prevention. SLCH established the first dedicated pediatric mobile health program in the region, providing dental care, asthma care and health screening services free of charge, thanks to generous contributions to the hospital’s foundation. St. Louis Children's Hospital is the world’s leading center for pediatric lung transplants, having performed more than 400 lung and heart-lung transplant procedures since the program’s inception. St. Louis Children’s Hospital has been recognized as “Leaders in LGBT Healthcare Equality” by the Human Rights Campaign (HRC) Foundation, the educational arm of the country’s largest lesbian, gay, bisexual and transgender (LGBT) civil rights organization. BJC HealthCare, of which SLCH is a part of, provides $570 million in community benefit. One of the country’s largest programs for heart failure and accredited by ACHA as an Adult Congenital Heart Disease Comprehensive Care Center. We are recognized as an Optum Congenital Heart Disease Center of Excellence and are one of only twenty-five centers in the US with sufficient volume and experience to meet the Optum Clinical qualification criteria. Our Heart Center has been designated as a Optum Congenital Heart Disease Center of Excellence since 2011. Our Extracorporeal Life Support Center (ECLS) Center was awarded the ELSO Award for Excellence in Life Support--Gold Level. Our ECMO teams supports patients experiencing heart/lung failure in the Heart Center, PICU and NICU. New technology, continuous stream monitoring, enables the medical team to record trends for patients' vital signs for the entire length of stay. The team can review hours, days or even months of data to detect patterns and anticipate a crisis. Dedicated Intensivist for the CICU, NICU and PICU in-house, overnight (24/7) providing support for emergency care, standard patient care and patient admission. Provides comprehensive initial assessments of infants and children with complex or challenging problems. One of the world’s leading treatment and clinical research centers for diabetes, providing comprehensive care for pediatric patients throughout the entire diagnostic and treatment process. Only pediatric hospital in St. Louis accredited by the American Diabetes Association. Treated the first diabetic child in the United States with insulin. One of the largest multi-disciplinary research programs on complications of sickle cell disease; a pioneering center for cancer treatment and research. One of the top three centers in the United States offering skilled care for children with immunologic and rheumatological disorders. National leader in the area of pediatric arthritis. One of the largest pediatric neurology departments in the country – 33 pediatric neurologists. Largest full-service, pediatric cerebral palsy program in the country. One of the largest and most comprehensive specialized epilepsy centers in the world. Offers a Level III neonatal intensive care unit, the highest classification of specialty treatment for infants. Leader in the nation for understanding the biology of how infant lungs work.